After a successful sale during the earlier releases of this shoe this year, the Jordan Brand is expected to hit strides once again with the release of two new colourways of the Jordan Play in These F TXT. The Jordan Play In These F TXT, which is one of the new models from JB this 2011, was a common site in the ongoing NBA playoffs and we must say that this model looks absolutely good inside the hardcourt. Coming out in Varsity Royal/White and Black/White-Metallic Silver anytime this month, the new editions of the Jordan Play In These F TXT is a must-buy so don’t dare miss it! 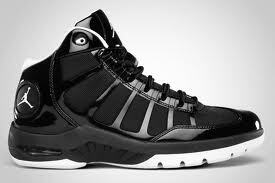 Jordan Play In These F TXT Unveiled! A New Jordan Play In These Q Out This Month!